We preview Aberdeen’s trip to Perth. 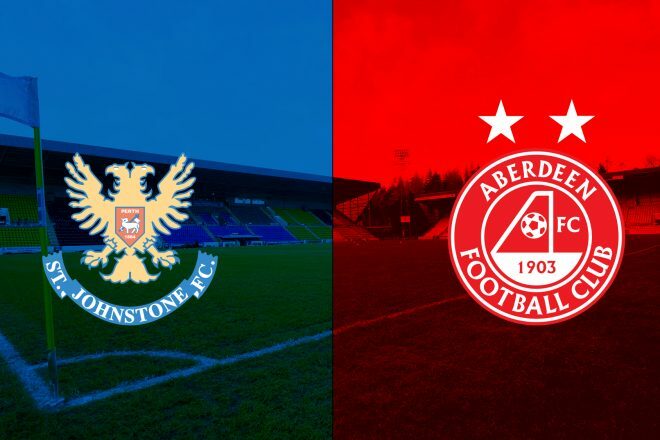 Aberdeen make the journey to Perth on Saturday to face St Johnstone looking to pick up their first league victory since the win at Easter Road at the start of the month. Last Saturday brought a disappointing 2-2 draw against St Mirren, but The Dons didn’t lose ground on Rangers in 2nd place and remain five points behind after Saints earned a goalless draw at Ibrox. For Saturday’s hosts they will be looking for their first win in six, which included a difficult triple header against Celtic in both league and cup. Tommy Wright’s side are still just inside the top six, two points ahead of Motherwell. 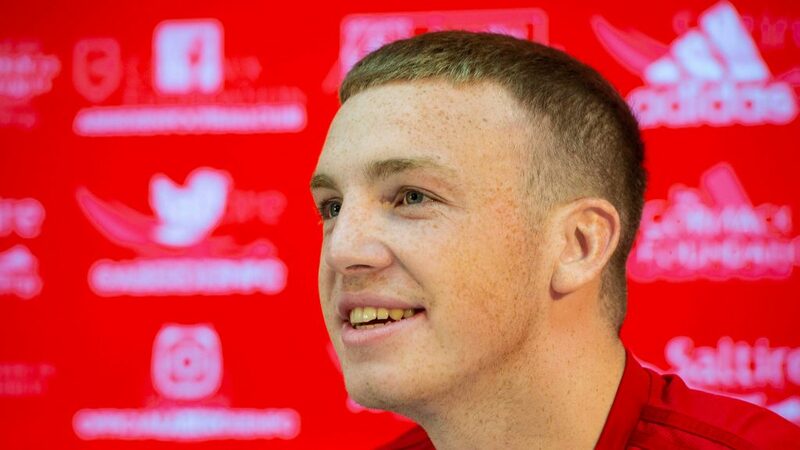 On Thursday lunchtime Derek McInnes and Lewis Ferguson, who signed a new deal at Pittodrie until 2024, spoke to the media together to discuss the new contract and look forward to the match with St Johnstone. “We’re looking for Lewis to keep improving and to try get as much experience as he can in an Aberdeen shirt by playing in Europe regularly, winning cup finals – not just taking part in them and being at the top end of the table. He’s handled everything that’s come his way brilliantly and the contract is a reflection of how well he’s done. “It was tough on Saturday. St Mirren came up with a game plan and fair play to them. They carried it out really well and it was difficult. We’re part to blame for that performance as we were poor. 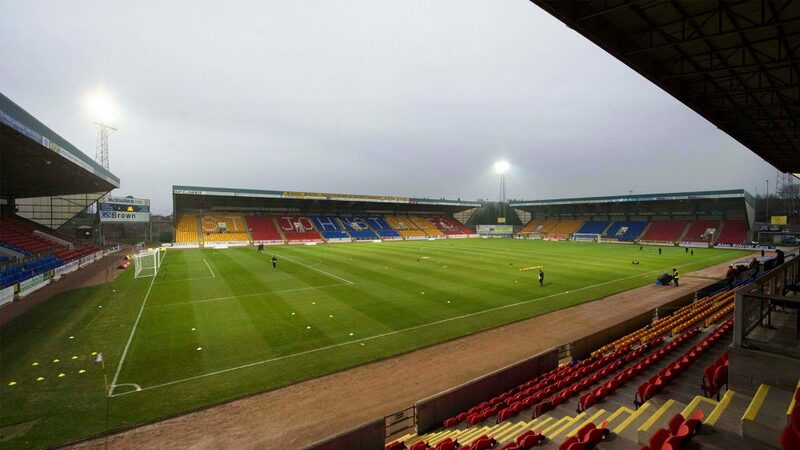 St Johnstone will likely be a similar opponent, as they did that when they won up here in December. They’ll sit in, allow us to have the ball and counter us and will see their chances from set pieces or counters. We expect a better performance for ourselves. Last year The Dons often found a way to produce their best performances against the men from Perth with comfortable victories in all three matches. This season however Saints have managed to frustrate Aberdeen on both occasions and have collected four points from the two matches. 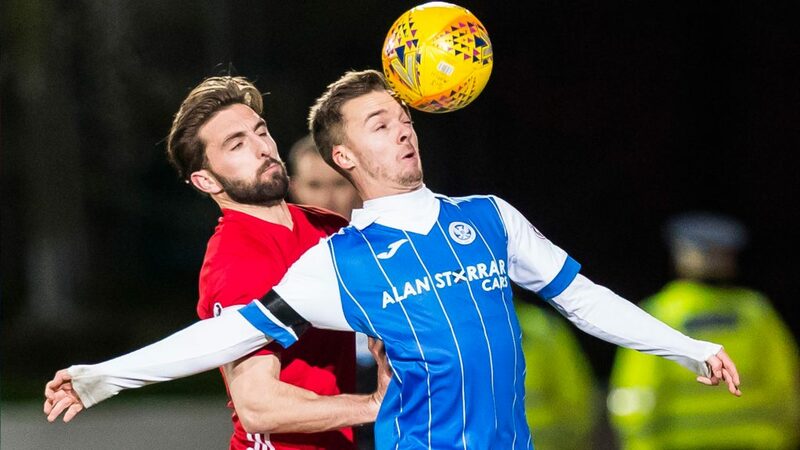 The first meeting of the season came in September at McDiarmid Park and it had a feeling of normal service had resumed between these two, which was a close affair. The hosts took the lead after McMillian lost his man in the box to head home after 15 minutes. 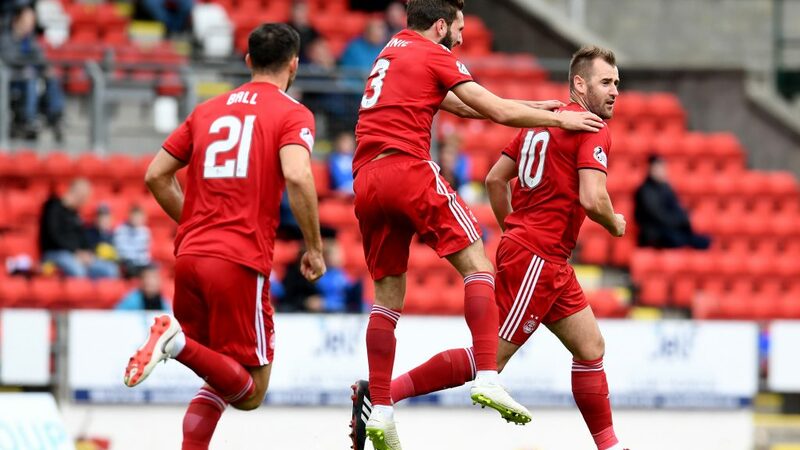 The Dons were up against it first half, but came out after the break well and Niall McGinn curled home an excellent free kick to level the score. They pressed for a winner, but ultimately had to settle for a point, despite having the lion share of the second half. After their impressive victory at Ibrox three days later The Dons were brought back down to earth when they lost 2-0 to an equally impressive St Johnstone at Pittodrie. Former Aberdeen defender Joe Shaughnessy came back to haunt his old club by giving Saints the lead on the hour mark. The game was effectively killed off moments later when Blair Alston brilliantly chipped Joe Lewis from the edge of the box after finding space. The Dons were never able to recover and the visitors left with the points. Saints won their first league match at Pittodrie on 21st November 1925 but had to wait until 2nd January 1964 to register their second! 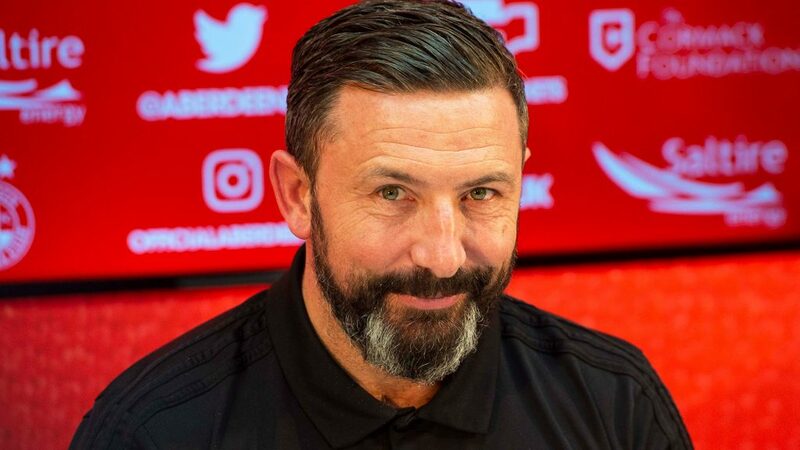 Aberdeen scored more league goals against St Johnstone at Pittodrie last season (7) than they did in the previous four seasons, when they racked up only six in nine attempts against their visitors from Perth. The biggest recorded attendance for a home league game against St Johnstone was 24,235 on 3rd January 1972 when goals from Arthur Graham (2), Joe Harper and Steve Murray saw the Dons win 4-2, Fred Aitken netting both for Saints. Meanwhile Joe Lewis has recorded 5 clean sheets against the Perth side. If you can’t make the match on Saturday make sure to tune into our RedTV coverage from 2.45pm. UK subscribers will receive the usual live audio from Dave and Andrew, while supporters abroad will receive pictures and commentary courtesy of our colleagues at St Johnstone. Aberdeen won their seventh successive away game this afternoon, equalling a club record. You have to go back to season 1970-71 for the last time it was done, and before then it over two seasons in 1936. Despite being stretched for available defenders with Logan, Hoban and McKenna all out, Aberdeen put in typically controlled team performance on the road. For large parts, they managed the game very well. 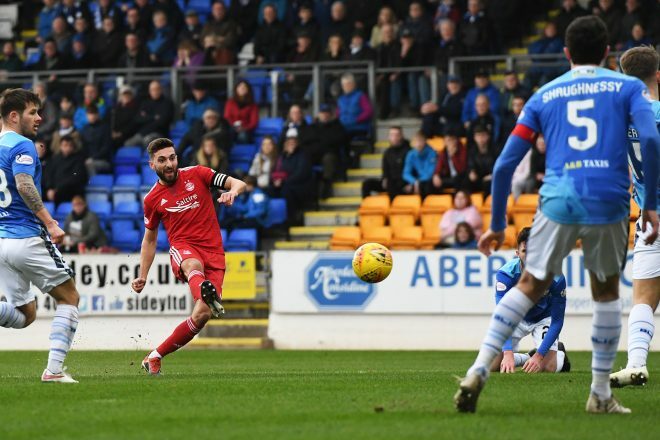 St Johnstone did have their chances, but the Dons won thanks to a brilliant performance by Graeme Shinnie. It really an outstanding all-round midfield display from the skipper who will certainly have impressed Scotland Manager Alex McLeish who was in the Main Stand. As well as his goals, he seemed to cover every blade of grass to close players down and set up a number of chances for team mates. Derek McInnes made two changes with Dominic Ball and Connor McLennan replacing the injured Tommie Hoban and Niall McGinn dropped to the bench. Miko Virtanen was named as a substitute. As expected Dom Ball lined up at right back and in the opening minute he had some touches in the Saints half but was unable to get on the final pass. 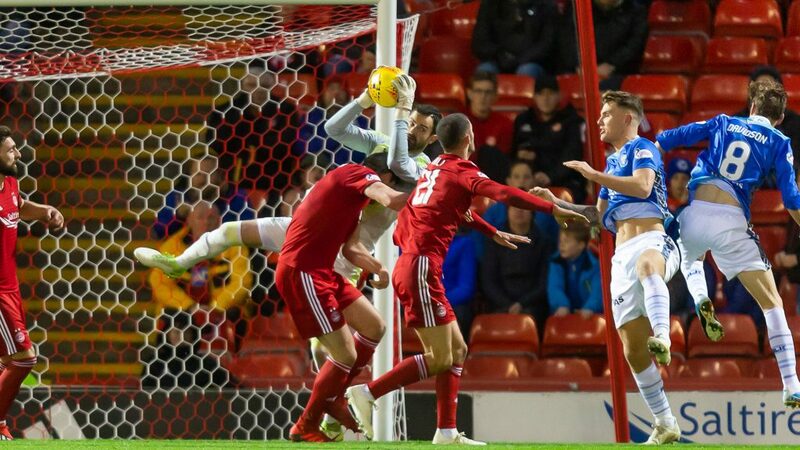 In the fourth minute Andrew Considine was forced to make a superb block on Matty Kennedy after the ball broke to him fortuitously inside the area although Aberdeen were guilty of failing to clear their lines. His long lunge almost certainly prevented a goal. From the resulting corner Shinnie blocked Kennedy to give away another corner from which St Johnstone had another great opportunity. The ball again was not cleared and when Davidson knocked it back into the six yard box Liam Craig was completely unmarked but was unable to make any real contact with his back to goal and Lewis was able to gather. I don’t think the midfielder realised how much space he had. Then on ten minutes Kennedy found space down the left and put over a great ball to the back post – Max Lowe under pressure did really well to knock the ball to safety before Devlin headed behind for a corner. A couple of real let offs for the Dons as the home side dominated possession in the opening ten minutes. Then sloppy play allowed Wotherspoon the chance to find Kennedy, again on the Dons right. The winger cut inside Ferguson and got a shot away, but it was straight at Lewis who was well positioned to make the save. On 13 minutes against the run of play Aberdeen took the lead. Kennedy took a poor touch midway inside his own half and Dom Ball did brilliantly to intercept and break forward. Dom had Greg Stewart in space on his right but he went left and picked out Shinnie. The Dons captain showed great composure on the edge of the area as he shifted the ball from his left foot onto his right and placed his low shot beyond Cammy Bell into the corner. On 16 minutes Liam Craig knocked a Mackay-Steven cross behind for a first Aberdeen corner, which Davidson knocked clear at the front post. For the next ten minutes there were no real incidents of note but Aberdeen were forcing the play and had some control over the midfield area with Shinnie putting himself about a bit. On 27 minutes Kane was strong enough to hold off Devlin, then when the striker went for the return pass he claimed he was taken out by Considine inside the area, which prevented him from getting on the end of the cross. There did not appear to be much contact but it was another let off for the Dons. Kane was winning a lot of the aerial battles. A minute later Ferguson might have done better when set up by Mackay-Steven inside the area, but he landed up chipping the ball into Bell’s arms. On the half hour mark Aberdeen had a corner which was again knocked clear at the front post. Lowe lost out in the midfield area and then suddenly Saints had a great chance when Sean Goss found Kane with a superb long ball. One v one with Dom Ball, Kane beat the right back, but Dom did just enough to hold him up and Shinnie got back to save the day. Kane was in fact booked for a lunge on the Aberdeen captain. The referee then decided not to book Foster and Goss for late tackles as the midfield battle continued. On 38 minutes Cosgrove did well to win the ball in behind. The play was eventually worked wide to McLennan who danced into the box before crossing for Mackay-Steven. He produced an excellent first time shot but Bell was able to make a smart block. On 41 minutes Foster did well to keep the ball alive and pick out Murray Davidson inside the area. His header was on target and Lewis was forced to tip the ball over. Before the break Aberdeen had to survive a couple more Goss corners. Right at the start of the second half there were chances at both ends. Kennedy hit a shot into the side netting then at the other end Ferguson flashed a low shot wide of the target. On 50 minutes Aberdeen wasted a golden opportunity to grab a second. Kerr had tackled Cosgrove but Shinnie picked his pocket, drove into the area and then squared the ball for McLennan who could only watch on and his first time shot rose over the bar. Saints were living dangerously as Kerr only just got to the ball ahead of GMS, the winger would have had a clear run at goal had he won the fifty fifty. It was quite an open game now which was suiting McLennan and Stewart as they were picking the ball up in space. On 54 minutes Tony Watt came on for Liam Craig. Two minutes later Aberdeen had another major let-off. Davidson won the ball in a good area before playing it early to Kennedy which meant he was isolated with Ball just covering. He beat the right back and his shot deflected off Considine and onto the post with Lewis beaten. On 58 minutes another surging run from McLennan but his forward pass could not quite find Cosgrove. Jason Kerr did well to get a foot in. Just the final pass was letting Aberdeen down at this point as they were getting into some good areas. Highlighted a few minutes later when GMS failed to find Stewart on the edge of the area. Saints tactic was now to try and get Kennedy on the ball as much as he could but Ball was sticking to his task really well. The right back had a good game and made a lot of decent interceptions. 64 minutes gone, great play by GMS but no one get on the end of his cross before Lowe won a corner. Again from the set piece Saints cleared easily and broke quickly and it was Ball who was forced to make a last ditch tackle this time. From the resulting throw-in Shinnie fouled Wotherspoon who won a free kick 25 yards out, at a good angle for a cross. Shinnie was then booked, not for the tackle but something he said to referee Euan Anderson. Thankfully Goss wasted the chance and Aberdeen this time were able to break. Stewart looked for the run of Lowe but Kerr made another good tackle. 68 minutes in, another two Saints corners but they could not work anything. Aberdeen had defended the set piece ball very well this afternoon. A minute later a first change for Aberdeen as Niall McGinn replaced McLennan. On 70 minutes Kerr was booked for a foul on Ferguson as Aberdeen threatened in and around the box again. McGinn took the free kick but floated the ball past Bell’s near post. Swanson then replaced Wotherspoon as Tommy Wright went all out for an equaliser. Kennedy shifted over to the right. On 72 minutes a really well worked opening from Aberdeen with GMS starting the move with a great flick for Shinnie. The two players combined again and the ball was crossed for Cosgrove but with the ball slightly behind the striker he could not get any power into his shot and it was an easy save for Bell. Would have been some goal. After 74 minutes after a good tackle by Ball on Swanson, Shinnie broke forward. He had options left and right, but decided instead to go for goal. It was a good decision as he riffled in a tremendous shot low across the keeper into the far corner. The skipper could not have caught the ball any sweeter. On 75 minutes Cosgrove had chance at the back of the area blocked. It was not quite his day but he was well marked by Jason Kerr. With fifteen minutes to go Stevie May replaced Greg Stewart whilst GMS was taken off after a thumping tackle by Foster, which resulted in a yellow card for the ex Don. Stephen Gleeson was the visitors third substitute. Saints pushed hard in the closing stages to make it an uncomfortable finale – we have had plenty of them at this ground over the years – but when Davidson sliced wide a chance after the decent move, Aberdeen were able to see out the game comfortably and they were probably the more likely side to grab a late goal, they had a number of half chances before Max Lowe produced a fine run and shot which went wide. Shinnie then picked out McGinn and his shot had to be saved by Bell before Cosgrove was flagged offside. At a difficult venue, a clean sheet, three points, another away win; a decent days work ahead of the two home games against Hamilton in the league and Rangers in the cup.